And you? Where do you listen music? 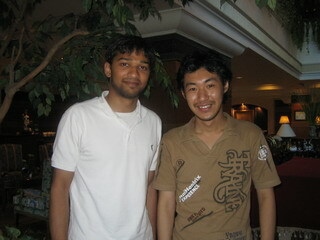 In this week Mr. Shadab Farooqui (CEO Ijigg.com) Live in Bangkok. I want to meet and Interview him. Thus I appointment him at Sunday. Projectlib : I want to you Introduction yourself. Ijigg.com : I?m Shadab Farooqui, an entrepreneur and co-founder of iJigg.com. I got my education in United States at Purdue University in Business Management. I grew up in Bombay, India and have been living in USA for 13 years. I am a big fan of music, especially small independent artists who may not have the resources to promote themselves in the crowded music space. Projectlib : ?Ijigg? what does it mean? Ijigg.com : Jigg is a popular dance from the 70?s. You may remember the? famous song ?Getting Jiggy with it?. That?s how we got the name. Jigg does not have a meaning. It?s just a cool and easy name to remember. Projectlib : Please tell me about concept in Ijigg? Ijigg.com : We were having a hard time filtering good independent artists. There were too many small artists in USA. We wanted to have a singular destination for all people to come, and simply enjoy great music by independent artists. The community ?Jiggs? or votes on the songs that they like. Depending on that and other variables, iJigg becomes a chart of the best independent music. It involves the community to decide which song should get the maximum exposure to the people to visit iJigg. Asia has a growing independent music scene that is in its infancy. 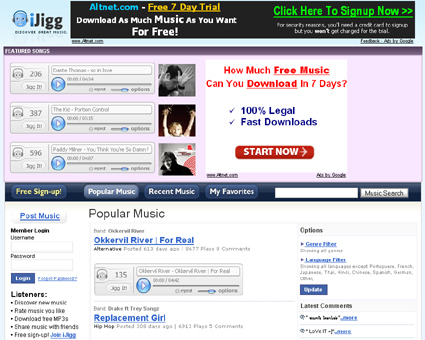 There are not many websites that can simple allow an artist to promote its music, or for fans to listen to music. We make promoting and listening to music simple, and a great experience. We will also be introducing ?Music Blogging?, writing about your favorite music. Projectlib : OK I see ?. Please tell me simply about How to Ijigg work? Ijigg.com : You go to www.iJigg.com You will see a bunch of music players, each with a song by itself. You can play the song, vote or ?Jigg? it if you like it, share it with friends, embed on your blog etc. For bands, they can upload their song, email it to their fans and mailing list, ask them to vote so that they can come on the front page and get more exposure. Projectlib : What?s primary goal of iJigg? Ijigg.com : I believe that every music artist should have the opportunity to become big, regardless of marketing budget. Projectlib : How many people in Ijigg?s team? Ijigg.com : We are three brothers working on iJigg, simply for the passion of Music. I manage the Business, Zaid Farooqui is the programmer and Bilal Farooqui (part time) manages the Hardware and Infrastructure. Ijigg.com : We have over 1 Million registered users. Projectlib : very much? Do you have partnership? how many? In Usa only? Ijigg.com : We work with small record labels and Bands from USA to give them exposure to SE Asia fans. Ijigg.com : iJigg was launched in January 2007. iJigg will celebrate its second birthday in a few months. We are very happy that it has grown to such a large community and are very happy about it. We started working on it full time only for last 6 months. I saved up some money from my previous full time job and put it all into iJigg. We are happy to serve the bands and the fans of iJigg. Projectlib : In thailand, music on web is fix cause licene and law, Ijigg is care about it? Ijigg.com : iJigg is compliant with all DMCA laws in the United States. The goal of iJigg is to promote independent artists. Most record labels do not mind their music on iJigg as their artists get exposure to a wide audience. Plus we do not let people download the music. If any record label or band has a problem with their music on iJigg, we are happy to remove it as long as we can get a written notice of the songs that they would like to be removed. Projectlib : What next in ijigg? Ijigg in the future?. Ijigg.com : iJigg will be a community of ?Influencers? and ?Followers?. Not just for music, but for everything with regards to entertainment. We will introduce Music blogging and diary, where people can write about the artists that they like, and influence their friends to listen to that music. Our philosophy is to do little, but to do it in the BEST way possible. That?s why you don?t see too much stuff on iJigg, as it becomes hard to manage. We plan on adding small features slowly. New iJigg with ?Friend Feed? style features is coming soon. cancel hard to manage. It confuses the people who visit ijigg. Projectlib : please take message for thai ijigg user and thai community? Ijigg.com : First of all, I want to say that I love the Thai community. Everyone is very friendly and welcoming. It is a pleasure to be a part of this community. I want everyone to continue using iJigg, and tell their friends about it. We will listen to what the community wants, and hopefully implement it. For all the independent artists, I encourage them to put their music on iJigg. We become very happy when we get email from Bands that tell us their success story through iJigg. Projectlib : Thank you for great interview and meeting at today. for meeting and this interview. I hope I will see you again.